4 Pics 1 Word Scale of justice. Court room. Gavel. Ferris wheel. Fair ground. Girl playing. Find the 4 pics 1 word answers you need and still have fun with the game that has hooked millions of people. 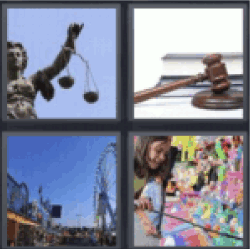 4 pics 1 word scale of justice.